How else would you celebrate a 10-year presidential term with no end in sight than with a 4-day radio and television broadcast of the president himself? Yes, my friends. 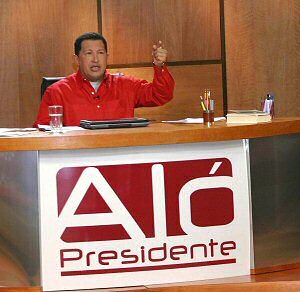 Just when you thought Venezuelan media couldn’t get any more interesting, President Hugo Chávez today announced that a special edition of Aló, Presidente, the radio and television show he started ten years ago, will kick off Thursday May 28 and will broadcast, uninterrupted until Sunday May 31st. Which I thought was kind of funny, because other than RDB there is not a lot of music going on in telenovelas -much less interviews, so we’ll just have to wait and see! This entry was posted in Politics, Television and tagged Aló Presidente, Hugo Chavez, Venezuela. Bookmark the permalink.